One of the most popular items we premiered at New York Comic Con is now available in our Rewards Zone — the Paper Girls enamel pin set! 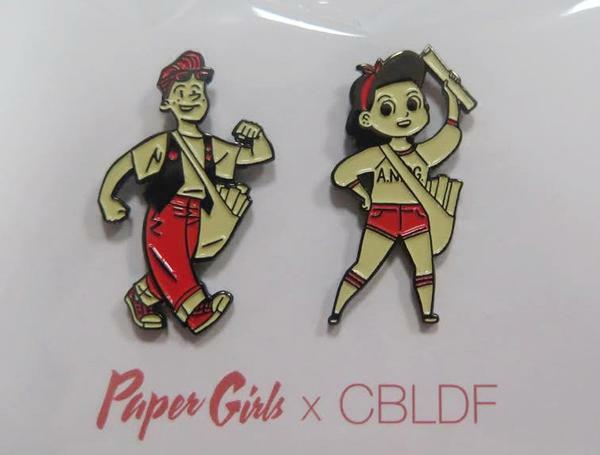 Based on the best-selling Paper Girls series by Brian K. Vaughan and Cliff Chiang, this pin set features the mascots of the American Newspaper Delivery Guild! Available as an exclusive fundraiser for the CBLDF, these pins come as a set, or as part of a package featuring Paper Girls Volume 1, signed by artist Cliff Chiang!